The article describes how passive dosing can be used to maintain stable exposure concentrations of the bacteriocide triclosan. A method that helps maintain stable exposure concentrations of organic contaminants over several weeks. This is described in an article by researchers at ACES that has been selected as one of the Best Papers of 2017 in the scientific journal Environmental Toxicology and Chemistry. Using this method it is possible to perform studies on how contaminants like triclosan, previously used in for instance toothpaste and as antibacterial agent in shoes, affect the environment. The article “Passive dosing of triclosan in multigeneration tests with copepods – stable exposure concentrations and effects at the low µg L-1 range” is co-authored by Anna Sobek, Anton Ribbenstedt, Elena Gorokhova and Magnus Breitholtz, all researchers at the Department of Environmental Science and Analytical Chemistry (ACES), together with Lukas Mustajärvi, former PhD at ACES and Philipp Mayer at the Technical University of Denmark (DTU). The article describes how passive dosing can be used to maintain stable exposure concentrations of the bacteriocide triclosan in a 6-week multigeneration test with the copepod Nitocra spinipes. Triclosan is an antibacterial chemical that has been used in everything from toothpaste to impregnation of shoes and when it leaks into nature it can give rise to resistant bacteria and cause other negative effects on aquatic organisms. 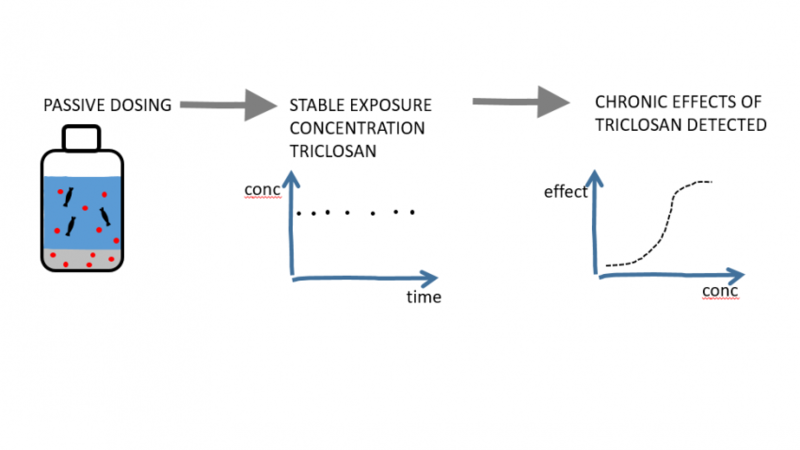 In this study triclosan was used as a model compound to represent the many similar chemicals in use and emitted to the environment, for which there is a great need to produce reliable data on effects in the environment. “Being able to maintain stable exposure concentrations of organic contaminants over several weeks is a prerequisite to enable understanding of potential long-term effects of these contaminants in the environment,” says the paper’s corresponding author, Anna Sobek, associate professor at ACES. “Many organic contaminants occur at low concentrations in the environment and may therefore not exert any acute effects. However, the constant exposure to contaminants at low concentrations can cause effects that are not detected in acute toxicity testing. One of the major challenges to detect such chronic effects has been to maintain stable exposure concentrations over the testing period,” says Anna Sobek. Environmental Toxicology and Chemistry (ET&C) publishes papers describing original experimental or theoretical work that significantly advances understanding in the area of environmental toxicology, environmental chemistry, and hazard/risk assessment. The article “Passive dosing of triclosan in multigeneration tests with copepods – stable exposure concentrations and effects at the low µg L-1 range” can be read here.